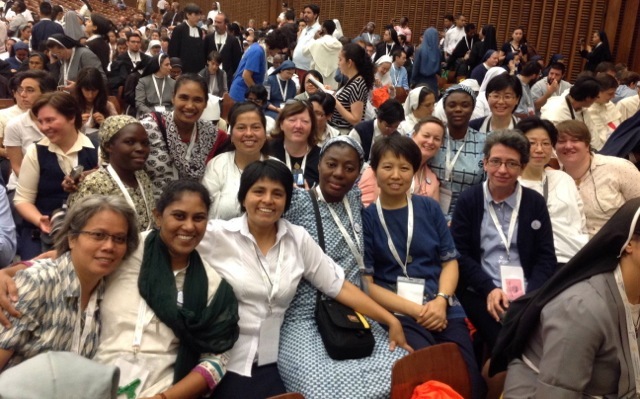 Sixteen RSCJ, including the probanists, attended the World Meeting for Young Consecrated Men and Women held in Rome on 15-19 September 2015. "We have just ended the international meeting of religious at the Roman Colosseum with a beautiful prayer in remembrance of the martyrs. During these days, we have been more than 5000 religious from more than 125 countries, from more than 500 religious congregations. The week has been intense, from morning to night -- intense, but very interesting, with lots of moments for reflection. Every morning we attended different talks in the Paul VI audience hall. In the afternoons we went into sharing groups according to language. These were followed by various activities in the evenings. Since each of us joined different groups according to our languages (English, French, and Spanish), we each had enriching experiences and reflections, which we hope to organize and share with you, along with some photos. In the meantime, we send you this link to the website with information about these days. It includes the audience with the Pope, which we found revitalizing, along with the different calls posed to religious life by the signs of the times." Janet Hopper, a novice of the Sacred Heart in the England-Wales Province, made a video slideshow of photos she took during the gathering. Click here to view the video on the ENW YouTube channel. Katie Colbran (ENW), Ruphine Ndimbani Mazowa (RDC), Kim Eun Jeong (KOC); Joanna Orpel (POL) was taking the photo.